I'm not starting on the mince pies until December. It just doesn't feel right to be getting Christmassy in November. I've just had two, that's two mince pies. Last edited by stuart on Sun Nov 12, 2017 1:58 pm, edited 1 time in total. 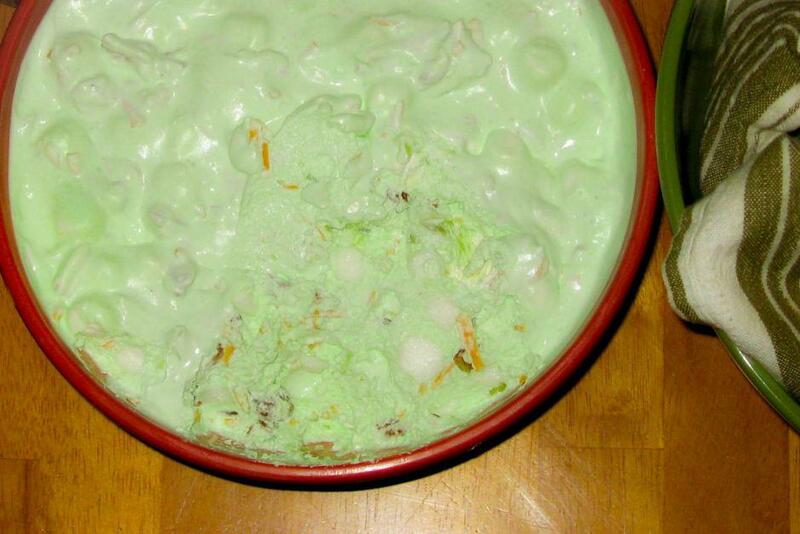 known as yum yum salad, is "a mix of jello, pineapple, cream cheese, mini marshmallows, pecans, and shredded cheddar cheese". I suspect that ID's head will explode when he sees this. Freddie wrote: I suspect that ID's head will explode when he sees this. Disgusting but at least not pretending to be an Italian recipe. Yum-yum salad looks uncannily like the alien vomit from Bad Taste. Never seen that before but yes. Imagine Sugar Puffs, Now given then an armoured exterior and a rock hard interior, like a dog biscuit but worse, strip away the sweet flavouring and replace it with something that tastes vaguely like burning plastic smells and you have these. Duck breasts, done in the pan and then the oven, with honey glazed baby carrots, some sautéed baby potatoes, and cauliflower cheese. Made a red wine sauce with shallots and stock and some of the duck cooking liquor. Remembered to score the skin and also to start from a cold pan. Go me! For the cauliflower, I sliced the head horizontally to get a geet big slice, which I then seasoned a bit and bunged into a hot pan to brown it on the top and bottom. While that was doing, I made a cheese sauce from a roux with a load of strong cheddar hoofed into it. Put the now-browned cauli onto a lined baking sheet, smother generously with the cheese sauce, pouring slowly so the sauce permeates all the nooks and crannies. Bung into oven for 25 mins at 200 (220 non-fan?). Was joined by the duck after 10 minutes. Duck rested for 5 minutes whilst I finished farting about with the carrots and potatoes. Worked. Aldi chocolate cheesecake for pudding - pretty fcuking good tbh. And a bottle of Aldi's £15 chateaneuf de pape, which was nice. I had a salt baked carrot at Hand & Flowers on Friday and never want to eat carrots in any other form. thekungfury wrote: I had a salt baked carrot at Hand & Flowers on Friday and never want to eat carrots in any other form. I just Googled them and will have to give them a try. You need to talk about more than carrots if you went there. At once please. I remember you've been there before (more than once?) and had his pork dish that won the Great British Menu. I was hoping that would be on the menu but unfortunately not. Food was excellent though and service was incredible. Only a little thing but when my wife to the loo a waiter came over and tidied up her napkin into a neat triangle. When I went to the loo later I deliberately tried to scrunch it up into the tiniest ball but when I came back there it was in a perfect triangle. I love watching cooking shows and appreciate the amount of prep that goes into making the simplest things at this level. It's essentially pub grub but elevated to 2 star standards. I had a ploughman's tart and my wife had a pasty as starters. When they arrived they seemed so dainty but they packed a huge flavour. ***Important to note these are not my pictures*** One of the guys I rode to Paris with is a friend on FB. He coincidentally happened to have gone there 2 days earlier and his wife had taken and posted dozens of pictures of their food and some was the same as ours. Both look simple and the pasty looks really plain but the flavours were immense. They're also so precise and our starters looked exactly the same as the ones above, right down to how browned the pasty was and how much of the mustard puree was on the plate. Dessert I had a toffee tart (Milk Toffee Tart with “Old English Spice” and Rhubarb Sorbet) which, whilst tasty, was the stickiest substance I've ever encountered. You know when you're piping a silicone sealant and you get some on your finger and can't seem to ever get it off? Basically that but insanely sickly sweet and sticking to the roof of your mouth and your teeth. Truth be told I didn't really like it and my wife won Dessert Wars with her souffle (Blackberry Crumble Soufflé with Baked Vanilla Cheesecake Ice Cream and Blackberry Sauce). It's a really relaxing informal place. I've eaten at Heston's pub and whilst the food was in a similar vein the place felt much more formal and stuffy than H&F which inside is just like a rustic country pub. I sat where that guy is in the white shirt next to the fireplace and other than the food/service you'd have thought you were in any number of regular gastropubs. Goood. Ive only been once and it was exactly as you described. I was concerned he might get a bit up himself and it become more formal since then but it seems nothing has changed which is a good thing. Funny you mention the pudding being a bit meh. In restaurants like those you always get a least one massively memorable course but I don't think I have ever had a desert anywhere that I have thought was anything extraordinary. I don't care if they put it inside quotation marks, it still means "lamb pork" which is imbecilic. I think if I'd gone to that place, the fury it would have built up in me would have forced me to storm across the room with a live lamb under my arm, (been living in Wales too long I think) kick open the kitchen door and below at chef " IS THIS A PIG OR A LAMB? WELL? IS IT!!!! Before hurling the beast at him and storming back out again. Il Duce wrote: "Lamb Porchetta"
Except porchetta doesn’t mean pork. Porchetta is the style of cooking a piece of pork (boned, stuffed, rolled then roasted). So this is lamb cooked in that style. In that case they should have put "porchettato"
Beh! I just served his arse to him on a plate. Might call it "Porchetatta culo zenzero"
TKF a ginge? Say it ain't so. Last edited by Freddie on Mon Nov 27, 2017 1:07 pm, edited 1 time in total. He's from Liverpool so it's probable. Il Duce wrote: He's from Liverpool so it's probable. Last edited by Freddie on Mon Nov 27, 2017 1:32 pm, edited 1 time in total. Bit weird. Not ginger or from Liverpool. Done! I'll let you know if the charlatan replies. Il Duce wrote: Done! I'll let you know if the charlatan replies. CTF in action! Be afraid hash slinger, be very afraid. Il Duce wrote: I thought you were TKF which was the Kirby Fake, and Kirby is in Liverpool. I think. Retracted if I'm wrong plus apology. My credentials were obvious to the cook: Italian. Thank you for your comments which we have passed on to the Head Chef and General Manager. Last edited by Il Duce on Mon Nov 27, 2017 2:44 pm, edited 1 time in total. I've just looked up that cook Tom Kerridge and was amazed to have already seen that wurzle on tv. The really will give Michelin stars to anybody these days. Even Tom says "he's not a Michelin star sort of guy" . I wholeheartedly agree there Tom.